A few weeks ago, my family got together to celebrate my dad's belated birthday. His birthday is at the end of December, but most of the family was elsewhere. I offered to make him a cake or cupcakes as my gift to him. His immediate request was carrot cake. I searched far and wide for a carrot cake recipe that satisfied me. I could not find one. Seriously folks. Every recipe I came across had strange ingredients, or the ratios that didn't sound quite right. I didn't want to spend time messing around with a recipe. I needed something I knew was going to work first time around and taste good too. So I resorted to cupcakes instead. Let me tell you, these cupcakes were a real hit. They were awesome! Perfectly moist with a wonderful blend of spices. 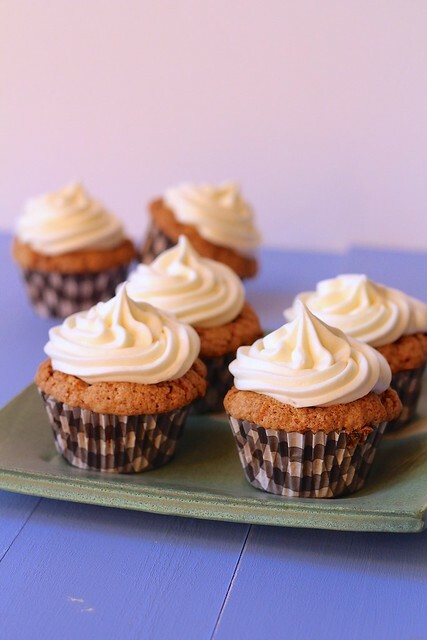 And of course a cream cheese frosting. My favorite! You can't beat it. My dad was extremely pleased. Especially since I made enough for him to take several home. 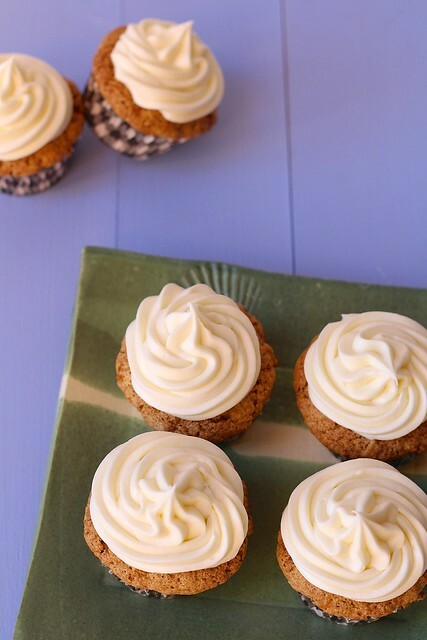 A fabulous, simple cupcake to please any carrot cake lover. Preheat the oven to 350ºF. Line two cupcake pans with paper liners. In a large mixing bowl, whisk together the flour, baking powder, baking soda, spices and salt. In a food processor fitted with a shredding disk, shred the carrots (you should have about 3 cups). Add the carrots to the bowl with the dry ingredients and set aside. Wipe out the bowl of the food processor and fit with the metal blade. Process the sugars and eggs until frothy and thoroughly combined, about 20 seconds. With the machine running, add the oil in a steady stream through the feed tube. Continue to process until the mixture is light in color and completely blended, about 20 more seconds. Transfer the mixture to the mixing bowl with the flour mixture and carrots. Stir with a wooden spoon until the flour is fully incorporated and no streaks remain. Scoop evenly into the prepared cupcake liners. Bake for about 20-24 minutes or until a toothpick inserted in the center comes out clean. Let cool in the pan for at least 5 minutes, then transfer to a wire rack to cool completely. 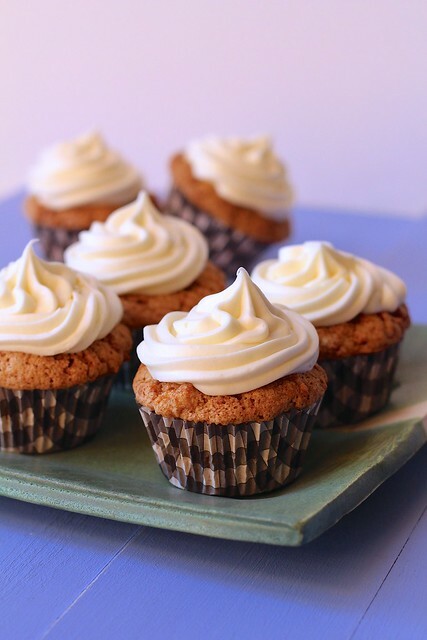 To make the frosting, in the bowl of a stand mixer fitted with the paddle attachment beat the cream cheese and butter on medium-high speed until well combined and smooth, about 2-3 minutes. Mix in the vanilla extract. Gradually beat in the confectioners’ sugar until totally incorporated, increase the speed and then beat until smooth and fluffy. Frost cooled cupcakes as desired.